Rali will play the Cell-hu (chel-hoo), an ethnically adapted Cello, only one of its kind. She will demonstrate the ties between her biography as a jew from the socialist Kibbutz community, where music influenced the ideals of the new Israeli society and her own musicality which is a blend of many other styles including Western Classical & Ethnic forms. 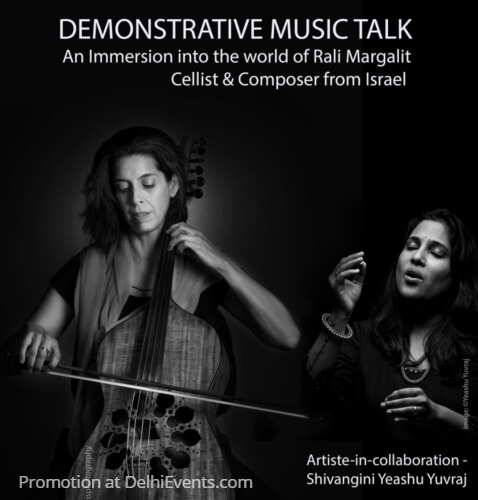 Rali will also explore musical collaboration with the Delhi based vocalist - Shivangini Yeashu Yuvraj, exploring cross cultural sounds. Cellist and composer Rali Margalit, a graduate of the prestigious Rubin Academy of Music and Dance in Jerusalem, started her way in music as a classical cellist. However, her curiosity and open mind led her to experiment with and play almost every style of music to be found in her native homeland, Israel. She performed in Israel and overseas with the best musicians in the field of Persian, Kurdish, Gypsy, Arab, Flamenco, Kleizmer and Ladino music. Having travelled the rich and winding paths of these various musical worlds, carrying valuable gifts and mementos from each of them, Rali strives to create her own special artistic language, merging all the musical worlds, and blending them with powerful literary texts, to tell a unique and compelling story. Shivangini is a versatile vocalist charting her journey of expression in what can be called as a confluence of 3 styles - Folk (from Uttar Pradesh), Classical (Hindustani) and Contemporary (Western). She is a vocal coach based in Gurgaon. She has been part of a host of projects as singer, programme manager, facilitator and composer across a diverse musical styles such as acappella, Poorab Ang Gayaki, Gurbaani & music for & by children. Shivangini holds an LRSL - ‘Licentiate in Performance’ from RSL Awards and a Masters in Hindustani classical vocals. Innately influenced by her hometown, Kanpur - a city with a blend of earthy yet urban lifestyle and juxtaposed with her life now in cosmopolitan NCR, Shivangini is nostalgically drawn to the evergreen freshness in the music of the 'folk'. Being a student of Late Guru Padmavibhushan Girija Devi who was synonymous to the music of the ‘Poorab’ (Uttar Pradesh), Shivangini soaked in the essence of the traditional music of her land.